Meet the interrobang. Unless you happen to be a typographic expert, you probably haven't encountered the hybrid question mark-exclamation point. It was actually invented in the early 1960s by ad exec Martin Speckter but as language researcher Anne Trubek suggested last year, it just might be the symbol of our times. Might we describe our current cultural zeitgeist as surprise superimposed over curiosity, mixed together with attitude? Is the interrobang a 1960s, type-based version of WTF? Is the interrobang a 1960s, type-based version of WTF? A certain informal, witty, knowing, WTF way of approaching the world? Many clever Facebook status updates and comments could be defined, as Wikipedia does the interrobang, as "A sentence ending with an interrobang (1) asks a question in an excited manner, (2) expresses excitement or disbelief in the form of a question, or (3) asks a rhetorical question." 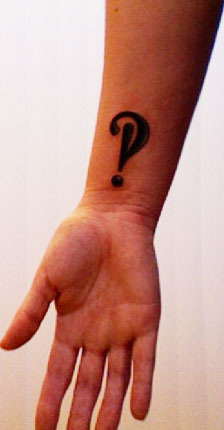 By now, I assume that you're sold on using the interrobang in your next Powerpoint (or getting it as your next tattoo), so you should know how to find it. If you've got Microsoft Word, it's hiding in the Wingdings 2 font. Hit shift+6 and you'll see the zeitgeist mark appear. One last thought on the interrobang: does anyone know how I could search for a piece of punctuation like this? Google says it ignores most punctuation, and I'm assuming Microsoft works the same way. I think most OCR systems do filter out non-standard punctuation. Case in point: This is a screen capture from the New York Times online obituary of Speckter. The interrobang has been erased from the obituary of its inventor.